The A9 from Perth to Inverness is a 100-plus busy old stretch of main trunk road and the gateway to the Highlands. Accordingly, it’s a popular route for trucks. About 20 miles north of Perth, and just five miles before Pitlochry, is the Ballinluig Services and Grill. 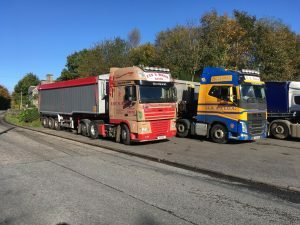 For truckers there is room for 25 trucks and there the chance to get fuel and stop for a meal. Ballinluig Services were established in 1970 by Clive Bridges and today the General Manager is Clive’s daughter Claire, so it’s a family business. 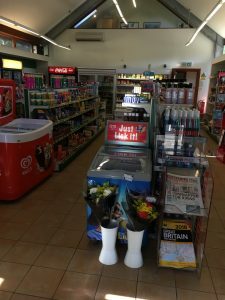 The site is split into two main parts – the grill serves a wide range of hot and cold food, and the services is a mini supermarket and also sells petrol as well as snacks, drinks, magazines and newspapers, toys and groceries. There is an extensive menu available at the grill. Breakfasts, which are available all day, start with the Full English, which comprises fried egg, black pudding, sausage, bacon, beans and fried bread and costs £6. A mini breakfast of just sausage, bacon and egg is a fiver. Scrambled eggs on toast of £4.25, while two fried eggs on toast is £3.95, as is two sausages or bacon on toast. Beans on toast is £3.75. A bacon roll is £2.80 while a sausage or black pudding roll is 20p cheaper and a fried egg roll is £2.30 and a scrambled egg roll is £2.45. Two breakfast items in a roll is £3.75. As well as breakfast rolls, the grill offers a range of filled rolls, and these include beef or ham (£2.55), salad roll with ham, beef, tuna mayo or egg mayo at £3.10, a meat free salad roll is £2.30 and a cheese roll at £2.40. The cheese salad roll is £2.85, a prawn roll is £3.50 while a bacon, lettuce and tomato roll is £3.60. An egg mayo roll is £2.40 and a side salad for any of these rolls is an extra £2.30. The range of burgers starts with a single burger at £3.45, cheeseburger or egg-burger at £3.75 and a veggie burger is £3.60. All these come with a relish and lettuce. Extras to be added to any main meal – sausage, egg, bacon, beans, peas, fried bread, black pudding, mushrooms, tomatoes, onion rings, burger or cheese are all 85p each. There is a variety of main meals starting with simple meals like chips and beans at £3.55 working up to Rib-eye steak at £10.25. In between are popular dishes such as fish and chips, scampi, omelettes, southern fried chicken, gammon, pies, jacket potatoes and salads. Prices vary, so check the menu for details. There is also a home cooked specials menu which is changed daily. The sweets menu starts with ice cream at £2.85 and also includes blackcurrant & apple pie at £3.80, apple pie at £3.70 and chocolate fudge cake at £3.85 – all three are served with ice cream. There is also homemade cheesecake, at £3.70, and fruit and ice cream at £3.60. Tea is £1.10 (small) or £1.30 (large), while coffee is £1.25/£1.55. Hot chocolate – only available as a large cup – is £1.80. Cold milk is £1.25/£1.50 and flavoured milk is £1.45/£1.70. For coffees, there is a choice, and a cappuccino is £2.50, espresso is £2.20 and latte is £2.50 – again, all are only available as large cups. Cans of pop are £1.30 and bottles are £1.60. Fruit juices are £1.25 and squash is 60p for a small cup or 75p for a large. 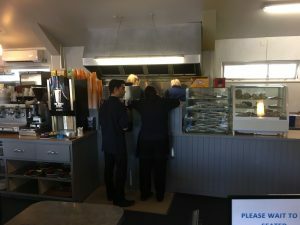 The grill offers quick and efficient table service and there is room for 60 diners at any one time, and if the weather is good, another 20 can sit outside. The services are open from 0700 to 2200 Monday-Friday and 0700-2100 on Saturdays and Sundays. The grill is open from 0800-2030 every day. The site has an ATM cashpoint and if the grill is closed, or is very busy, there is a coffee machine available. The petrol station also has a mini supermarket inside the shop and accepts all major credit and debit cards. There is CCTV covering the whole site and the trucks can park for free. There are also showers available – which cost only a pound for 20 minutes use. There are three high-speed HGV fuel pumps and four petrol and four diesel pumps on the forecourt for cars and vans. There is bunkering for Keyfuels, UK Fuels, Securicor, Routemate, BP Agency, All Star, Supercharge, and Morgan Fuels. This is a handy place to stop, and it’s just a couple of minutes off the A9. The fact it is free to park and the showers are so cheap mean it is a great place for drivers. I did stop to eat here but sadly the grill was absolutely rammed with people queuing outside the door, so it was not practical to stop for a meal. 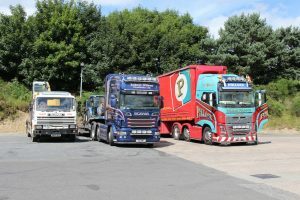 That is something that drivers need to consider – but I called in on a very hot summer’s day in the school holidays and the majority of the trade was families. I would imagine at the end of the day it would be quieter for drivers and especially so outside of the high tourist season. It might be worth ringing ahead and booking your meal.